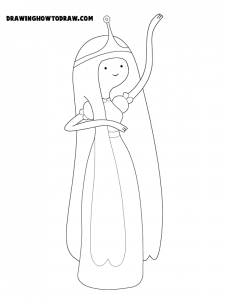 Learn how to draw Princess Bubblegum from Cartoon Network’s Adventure Time with the following step by step drawing lessons. 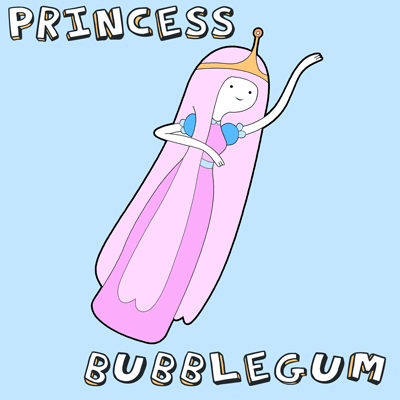 Princess Bubblegum rules the Candy Kingdom, an empire whose inhabitants are also composed of sweets. Her proficiency in science and fluency in German is testament to her high intelligence. Finn is shown to have a crush on her. While she is typically kind and well-mannered, her temper can be a powerful force when provoked. First draw a circle for Princess Bubblegum’s head … draw a bubble letter ‘L’ for the left arm and a bubble letter ‘s’ like shape for the right arm. Draw the outlines of her hair. For the body, draw a curved rectangle like shape. Now form the actual shape of her body by curving everything up like a real woman’s body. Draw a letter ‘w’ like shape inside of Princess Bubblegum’s dress. Draw circles for sleeves. Draw another letter ‘w’ at the bottom of her hair on the right side. Draw number ‘3’s (with an extra hump) on both hands for fingers. Also draw her crown and face. The face is a very simple smiley face (two circles for eyes and a curved line for a smile). Now erase the guidelines that we don’t need anymore and any mistakes that you might have made. Also darken the important lines. 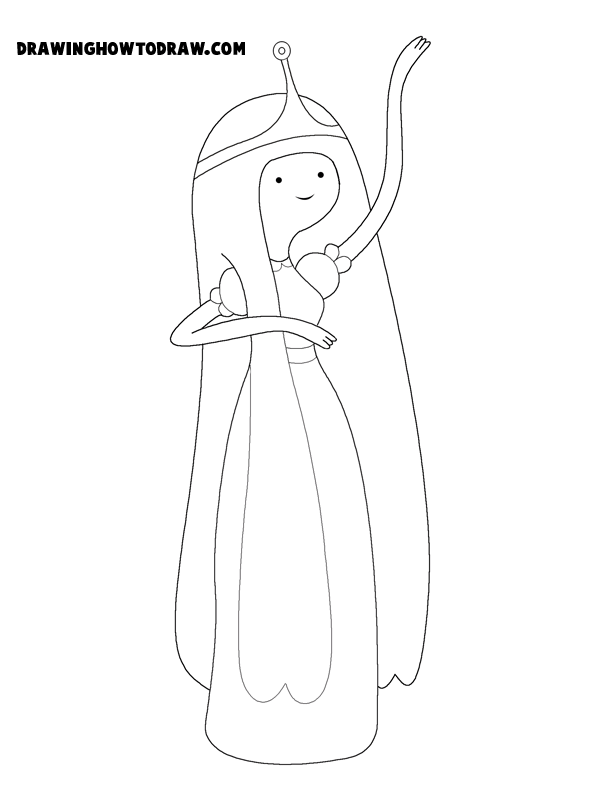 Now you have a great Princess Bubblegum to show off to your friends and family. If you wanted to color in Princess Bubblegum, these are the colors (above) that she should be. so epic my daughter loves it she wants loads of princess bubblegum colouring pages thanks for the step I think I have improved. I thought that this was really helpful and it works really well. Me and my friends pretend that we are characters in adventure time. Guess what? That’s me!